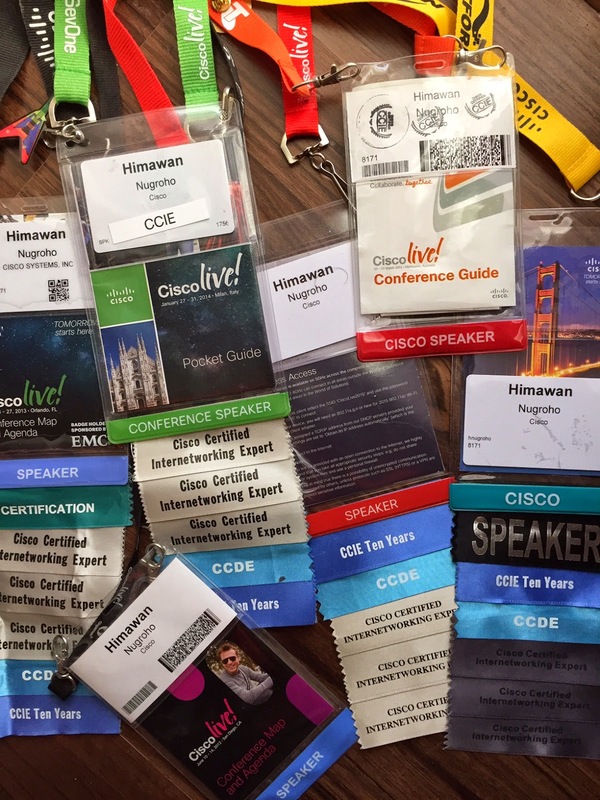 I’ve been going to Cisco Live as one of the speakers for several years now. As Cisco employee, you can go to Cisco Live (for free) only if you are a speaker, or part of the World of Solutions exhibition, or if you come for the customers, or to support the network infrastructure for the event. For the past three years at Cisco Live I’ve been sharing strategy and tips and tricks of how to become CCIE based on my own experience. My part of the session is focusing on skill development planning to achieve the objective, which is to pass CCIE lab exam. There are many technical sessions available during the event, but only very few talk about how to build learning plan and walk you through step by step of sample plan created by someone who has done it. I believe the session material can be applied outside CCIE context, and it’s relevant with my previous post, so I’m going to share it here with some updates. Robert Grant mentioned that strategy is the means by which individuals achieve their objectives. In short, successful strategy can be achieved by having clear and consistent goal, understanding the environment or the industry as well as our capabilities, and executing with effective structure and system. What do you see at the end of the road? What is your objective? What are you planning to accomplish? Having a clear goal can help you to plan on how to achieve it. Your goal can be your one thing. Whatever it is, you must have a goal or objective. If you don’t have it yet, go find one. To make it easier to digest, I will use an example here. Let’s say today you are a network engineer who puts a goal to become Network Function Virtualization (NFV) Solutions Architect someday. How to eat an elephant? Cut it into pieces and eat one piece at a time. Big goal must be dismantled into pieces so we can understand it well. What is NFV? What does Solutions Architect do? 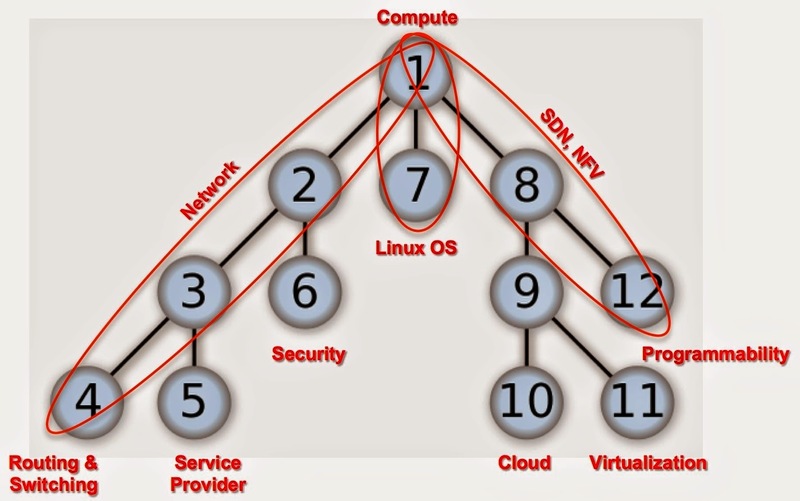 As per Wikipedia, NFV is a network architecture concept that proposes using IT virtualization related technologies to virtualize entire classes of network node functions into building blocks that may be connected, or chained, to create communication services. As described by ETSI NFV whitepaper, Virtualization eliminates the dependency between a network function (NF) and its hardware, as seen in typical physical network appliances, by creating a standardized execution environment and management interfaces for the Virtualized Network Functions (VNFs). ETSI defined NFV framework into three main components: Virtualized Network Function (VNF), NFV Infrastructure, and NFV Management and Orchestration (MANO). Don’t forget the northbound/southbound and interface to connect between the components: Rest API, OpenFlow, NetConf, data format with Json and XML, and if you are into data modeling: YANG. And some of the components require customization and module expansion using programming language such as Python and Java. Solutions Architect is someone who can articulate problem statements, solution capabilities and the gaps between the two. He or she must correlate business issues around technology and processes, and able to create an architectural solution specific to a given customer or segment. Solutions Architect needs to interpret business requirements and strategies, and mapping them to solution capabilities, and driving the integration of the solution into an existing infrastructure, which would drive systems integration and implementation approaches. To become Solutions Architect one must possess customer skill, business oriented mindset, communication, ability to collaborate, planning skill, leadership, and problem solving skill. Above all, it is important for a Solutions Architect to be able to solve the puzzle, put all the pieces together, and to connect the dots. Now you have a better picture of your goal, it is important to understand where you are standing today and see the gaps. Bruno, CCIE program manager and my co-speaker at Cisco Live, is very famous with his mantra: "Know what you don’t know". This is the question I always ask from time to time: How do you define success? If you have the list of required skills to become NFV Solutions Architect from both technical and non-technical, and you have done self assessment to understand your current situation, what level should you target for each skill? In a perfect world, we need to be 5 in everything. But we don’t live in a perfect world. The challenge will be the time. Our time is limited so we have to prioritize. We need to define which skills we have to develop to reach level 5 and which skills we can develop only to reach level 2 or 3, at least for time being. To pass CCIE Routing & Switching lab, for example, you must possess level 5 of core knowledge such as IGP Routing, BGP, MPLS. They are defined as core knowledge due to the amount of exam questions about the topic, and in the lab that technology is the foundation that put everything together. You can’t build a working solution if you are unable to make the core technology works. You may reach only level 3 for QoS or security, and still able to pass the exam since they are not the core knowledge. But how we define target performance level for NFV Solutions Architect? My advise is to start from the top. NFV solution comes from the business (top) to the physical implementation (bottom). Solutions Architect must be proficient with the top level: business requirement and strategy, and end to end solution architecture. You should target for level 5 on that. Then going down to the translation of the requirement into the technical solutions. Then going down to how the orchestration can manage multiple domains. Once you are good with all those, you can go down to virtualized infrastructure manager such as OpenStack. If you still have time, build capabilities on VNFs, hypervisor and host operating system. Then all the APIs and interfaces between components. Then programming language, and so on. Try to target the highest level on the top, and moderate level as you go down. Nothing stopping you to pursue and master physical network knowledge first. But if you are really good in individual technical component, but can’t understand the business driver as well as the overall solution, then you are still at engineer level. A very good engineer perhaps, but not a Solutions Architect. To give point 4 more concrete example, you may want to use Tree Traversal as I wrote in my previous post. It offers two different approach in visiting each node in a tree data structure: Depth-first, go down first e.g. first child, then grandchild before second child, and Breadth-first, go across first e.g. first child, then second child before grandchildren. Your decision to pick which approach, depends on your current situation. Perhaps you are in a work environment where everyone is expected to become a domain expert first, hence you may choose Depth-first. Or perhaps you are being supported to become a Solutions Architect and it is better to start by knowing the whole picture to begin with, then go with Breadth-first approach. How to build learning path for non-technical skills? Indeed certain skills such as communication, leadership or connecting the dots usually comes with experience. But you can still equip yourself with some books or courses that teach foundation knowledge of those topics. And you don’t have to take MBA to understand the business, but it may help to look at the program curriculum and pursue the knowledge defined in it. For technical skills, the path can be set by following certification program. Not everyone is a big fan of certification, but the program creator usually spent quite amount of time to define the level of expertise as well as the scope of each level, why not leveraging this instead of reinventing the wheel? And you don’t have to take the exam if you don’t want to, just follow the learning blueprint of the program. You can use Cisco certification for networking, RedHat or Linux Foundation for Linux OS, VMware for virtualization and hypervisor, Mirantis or RedHat for OpenStack and so on. When you are in process of learning something, it is important to get a feedback to measure your progress. The exam in certification program can be a feedback: if you pass it means you have reached the knowledge level as defined by its creator. Or you may want to get a feedback by getting involved into the discussion. Find out who is the domain expert and try to discuss with him or her to validate your assumption of what you think you already know. Or provide assistance for those who have just started to learn. Seek a feedback by teach the knowledge to others. It was Albert Einstein who said "If you can't explain it simply, you don't understand it well enough." I’m just stating the obvious here, but please make sure you have all the access to learn the knowledge. From a simple Internet connection, training material, online library, whitepaper, books, to lab equipment to practice and allocated time and place to study, make sure you don’t have anything to stop you in learning. 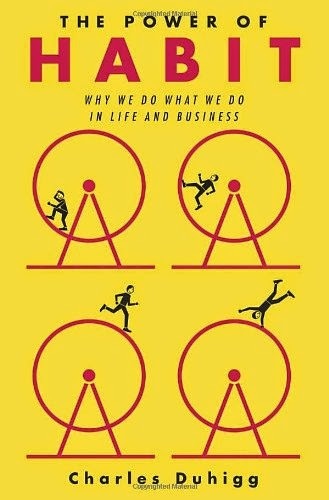 In The Power of Habit, Charles Duhigg takes us to the thrilling edge of scientific discoveries that explain why habits exist, and how the right habits were crucial to the success of Olympic swimmer to CEO. There are many examples in the book of how implementing so-called keystone habits can earn billions and mean the difference between failure and success, life and death. You have to make learning as your habit. And you can do that by starting it slowly, but be consistent. If you plan to spend at minimum an hour a day to learn something new, then do that and stick with it. Later you can increase the amount of time you want to allocate. Later, once it has become your habit, you will find that it is part of your daily routine and something you can’t skip. If you asked me 15 years ago if classroom training is necessary, my answer would be no. Why would you waste your time sitting inside the class, listening to someone who may know only how to teach, instead of doing the reading yourself and trying to apply the knowledge directly? I passed all my CCIE and CCDE exams with a very minimum number of trainings. But if you ask me again now, my answer is: you may want to consider to go to classroom training. Not because you can’t learn by yourself, but the training can accelerate your learning and shorten the time required to understand the new knowledge. We are all busy so it is good to have someone helping in explaining complex subject to us. Just make sure the instructor is someone who has experience in applying the knowledge in real world, so you will get the knowledge not only the one from the training material. Another reason is classroom training gives us break from our daily work. You are excused not to reply to your email immediately or to pick up the phone since it is in silence mode: you are inside the classroom listening to the instructor! Your boss or colleague or even customer can be informed in advance and usually they respect your training time and give some space. By now I believe you have already know what are your strengths and weaknesses. If communication is your strength point, exploit it. Put yourself as the key person to discuss with the customer to get the requirement. So even if technical skills are your weaknesses, you can manage them by delegating the technical tasks to the engineers. It is important to emphasize that as Solutions Architect your strength point should be the one that is closer to the business on the top. This can cover your weakness at the bottom such as technical implementation, at least for the time being while you are developing the skills. So if you feel that technical detail is your only strength, while you really have to develop your business mindset and communication skills, exploit it by becoming Subject Matter Expert in some technical domains. You are not a Solutions Architect yet, not from the business people perspective, but at least you have a good value to contribute to the team and slowly you can develop the required skills to become one. Last but not least, you have to believe you can achieve your goal. Your mind can play trick with you. Many have not even tried to pursue their goal because they don’t believe it can be done. Skill development plan is important, but what more important is the process in planning it. Start developing the plan and follow it. Achieve small success at a time. Believe it is possible as long as you continue to execute your plan. Only by believing that he is the one, Neo is able to stop the bullet. So start building your career strategy now using the points above as guidance. Then implement it with commitment, consistency and determination. Don’t forget to have fun during the process. “We must learn how to be the CEO of our own careers"